How the immune system affects tissue regeneration is not well understood. In this study, we used an emerging mammalian model of epimorphic regeneration, the African spiny mouse, to examine cell-based inflammation and tested the hypothesis that macrophages are necessary for regeneration. By directly comparing inflammatory cell activation in a 4 mm ear injury during regeneration (Acomys cahirinus) and scarring (Mus musculus), we found that both species exhibited an acute inflammatory response, with scarring characterized by stronger myeloperoxidase activity. In contrast, ROS production was stronger and more persistent during regeneration. By depleting macrophages during injury, we demonstrate a functional requirement for these cells to stimulate regeneration. Importantly, the spatial distribution of activated macrophage subtypes was unique during regeneration with pro-inflammatory macrophages failing to infiltrate the regeneration blastema. Together, our results demonstrate an essential role for inflammatory cells to regulate a regenerative response. The cells of the immune system are essential to defend an organism from disease. In addition, some of them are also thought to play an important role in helping injured tissues heal or even regrow. For example, when an animal is injured, immune cells such as macrophages rush to the wounded site to clear debris and help repair the damage. Macrophages come in different forms and subtypes, and express different protein markers on their surface, depending on where in the body they reside. Few mammals can completely renew or regrow a damaged tissue – a process known as tissue regeneration. Instead, humans and most other mammals repair injuries by producing scar tissue, which has different properties compared to the original tissue it replaces. One exception is the African spiny mouse, which, unlike other rodents studied, can regrow skin and fur, nerves, muscles, and even cartilage. It has been shown that in highly regenerative animals such as salamanders and zebrafish, macrophages are necessary to initiate tissue regeneration. Documented cases of tissue regeneration in mammals are rare and therefore less understood. Until now, it was not clear why two species as closely related as spiny mice and house mice would heal identical injuries in different ways. To better understand how new tissue regenerates, Simkin et al. compared the healing abilities of spiny mice and house mice after they received an injury to their ear and showed that macrophages appeared to be important for both the regeneration of new tissue and the formation of scar tissue. When Simkin et al. removed all macrophages in the ear of spiny mice, their ear tissue could not heal and regrow. When the macrophages were allowed to re-invade the injured site, the tissue in the ear regenerated. Further experiments showed that during tissue regeneration and scarring, different subtypes of macrophages appeared to be active. The findings suggest that specific subtypes of macrophages could be a key element in helping tissue to regenerate. An important next step will be to further explore the different types of macrophages and whether the injury site determines what types of cells are active. A deeper understanding of how tissues can regrow in mammals will be essential to advancing our ability to stimulate tissue regeneration in humans. Over the past three decades, regenerative biology has merged its rich historical practice with new genetic tools to discover how animals are capable of regenerating tissue and organs. Regeneration biologists commonly investigate organ regeneration in a range of metazoans including hydra, planarians, crickets, zebrafish, salamanders, newts, lizards and even some mammals. Conventional studies perturb cellular functions or genetic pathways to inhibit the normal regenerative response and thus seek to identify key cellular and molecular mechanisms underlying the regenerative response to injury. Alternatively, some investigators have employed a comparative approach to discover key mechanisms underlying regeneration. In this framework, two related species undergo different responses to injury in identical tissues and exhibit either a regenerative or a scarring response (Gawriluk et al., 2016; Sánchez Alvarado, 2000; Sikes and Bely, 2010; Wagner and Misof, 1992). This comparative approach may be particularly useful for unraveling complex interactions such as how inflammation and immunity permit, instruct or inhibit local cells to initiate and undergo functional regeneration in lieu of scarring. Exactly how cellular inflammation and immunity affect regeneration remains controversial. One perspective posits that inflammation impedes regeneration (Harty et al., 2003; Mescher et al., 2017), a view supported by reports of less robust immune responses in animals and tissue that regenerate when compared to those that cannot (Brant et al., 2016; Mak et al., 2009; Mescher et al., 2013; Redd et al., 2004). Similarly, chronic inflammation leads to compromised healing and fibrotic disease (Martin and Leibovich, 2005; Riches, 1988; Wynn, 2004). However, physical injury elicits inflammation during regeneration and scarring. Specifically, cytokines and chemokines produced by neutrophils, macrophages and T-cells recruit fibroblasts, promote granulation tissue formation, activate myofibroblasts, and promote collagen production and deposition (Aliprantis et al., 2007; Lakos et al., 2006; Mori et al., 2008; Ong et al., 1999; Smith et al., 1995). Dampening the inflammatory response by depleting leukocytes creates better healing outcomes following damage to skin, skeletal muscle, and liver (Dovi et al., 2003; Duffield et al., 2005; Martin et al., 2003; Novak et al., 2014). Thus, when one considers that injury-mediated inflammation and immunity is an ancient process shared by animals (and plants) that can and cannot regenerate, a more nuanced relationship between regeneration and immunity emerges. Mounting evidence suggests that certain immune cells may be necessary to induce and sustain regeneration. Depletion of phagocytic cells (e.g. macrophages and dendritic cells) inhibits regeneration in axolotl limbs, zebrafish fins, and neonatal mouse hearts (Aurora et al., 2014; Godwin et al., 2013; Petrie et al., 2014). Furthermore, the timing of leukocyte depletion has a major impact on regenerative outcomes (Arnold et al., 2007; Duffield et al., 2005; Varga et al., 2016) supporting an important role for changing immune cell phenotypes (Gensel and Zhang, 2015; Koh and DiPietro, 2011; Mantovani et al., 2013). Although these findings support a positive function of certain immune cells on regeneration, they also simplify important differences across species. For instance, salamanders lack important T-cell phenotypes and utilize primarily IgM rather than IgG antibodies while mounting an adaptive immune response (Chen and Robert, 2011; Cotter et al., 2008). While this diversity is of interest to biologists, it may obscure the goal of regenerative medicine -- to induce regeneration in humans. This makes mammalian models of tissue regeneration especially relevant to questions regarding what role immune cells play during regeneration. Since first described by Markelova (cited in Vorontsova and Liosner, 1960), ear pinna regeneration has remained an interesting example of musculoskeletal regeneration in mammals (Gawriluk et al., 2016; Goss and Grimes, 1975; Joseph and Dyson, 1966; Matias Santos et al., 2016; Seifert et al., 2012a; Williams-Boyce and Daniel, 1980). Recent work in African spiny mice species (Acomys cahirinus, A. kempi and A. percivali) supports ear pinna regeneration as an epimorphic process (Gawriluk et al., 2016) aligning it with appendage regeneration in other vertebrate regenerators such as salamanders, newts, zebrafish and lizards. Importantly, not all mammals can regenerate ear tissue providing variation to compare regeneration and scarring in identical tissue (Gawriluk et al., 2016; Williams-Boyce and Daniel, 1986). Spiny mice are able to regenerate full-thickness skin, blood vessels, nerves, cartilage, adipose tissue and some muscle, whereas the same injury in Mus musculus (outbred and inbred strains) leads to incomplete ear hole closure and scar formation (Gawriluk et al., 2016; Matias Santos et al., 2016; Seifert et al., 2012a). Here, we report how the two main orchestrators of inflammation, neutrophils and macrophages, respond to injury during epimorphic regeneration in Acomys cahirinus compared to scarring in Mus musculus. Acomys and Mus exhibit the same circulating leukocyte profiles, and we demonstrate a robust acute inflammatory response in both species. We demonstrate higher neutrophil activity in the scarring system compared to higher ROS activity in the regenerative system. We show that macrophages between the two species display similar in vitro properties providing a comparable baseline prior to and following injury. We also observed distinct differences in the spatiotemporal distribution of macrophage subtypes during regeneration and scarring. Finally, depletion of macrophages, prior to and during injury, inhibited blastema formation and regeneration, thus demonstrating a necessity for these cells. We first set out to test if baseline differences in circulating peripheral white blood cell (WBC) profiles existed prior to injury in Acomys and Mus. Using a Sudan Black B modified Giemsa-Wright stain, we quantified monocytes, lymphocytes, neutrophils and eosinophils from Acomys and Mus whole blood (Figure 1A–D). Both species exhibited similar profiles and typical morphologies for all four cell types (Figure 1A–E). For instance, monocytes were distinguishable by their kidney-shaped nucleus and diffuse cytoplasmic stain (Figure 1A), while lymphocytes were similar in size to RBCs and their compact nucleus filled the entire cell (Figure 1B). Polymorphonuclear neutrophils stained strongly with Sudan-Black B and displayed multi-lobed nuclei (Figure 1C). In contrast, while eosinophils displayed multi-lobed nuclei and dark pink granules in the cytoplasm they contained few if any Sudan-Black-stained granules (Figure 1D). In Mus and Acomys, the percentage of circulating lymphocytes was significantly higher than other leukocyte populations, and eosinophils comprised the smallest population of circulating leukocytes (Figure 1E) (Tukey’s Multiple comparison, simple effect p<0.05, Figure 1—source data 1). These data are consistent with other leukocyte profiles from outbred CD1 mice showing that lymphocytes comprise the highest percentage of circulating WBCs (Hedrich, 2004). Importantly, while we identified differences in the percentage of leukocyte subtypes within each species, leukocyte profiles were the same between Acomys and Mus (two-way ANOVA, species effect F = 0.01, p=0.92, and leukocyte subtype effect F = 97.04, p<0.0001, n = 8 Acomys; n = 4 Mus). Our data demonstrate these two rodent species possess the same circulating leukocyte profiles prior to injury and provide a baseline to ask if local differences arise following injury. Building on our observation that circulating leukocyte populations are similar in Acomys and Mus, we next assessed the acute inflammatory reaction to injury during epimorphic regeneration and scarring using our 4 mm punch assay through the ear pinna (Gawriluk et al., 2016; Seifert et al., 2012a) (Figure 2—figure supplement 1A–C). To quantify the influx of myeloid cells into the injured ear tissue, we performed fluorescence-activated cell sorting (FACS) using CD11b (Figure 2A–C). CD11b (aka ITGAM) is a broad-spectrum marker used to isolate mammalian macrophages and neutrophils across a range of species from mouse to humans (Figueiredo et al., 2013; Sawano et al., 2001; Tamatani et al., 1991; Venneri et al., 2007; Venosa et al., 2015). Using our recently published regeneration transcriptome for Acomys, we found Cd11b was upregulated after injury (Gawriluk et al., 2016). Alignment of Acomys and Mus Cd11b revealed 88% nucleotide identity compared to a 79% identity between Mus and Human (Table 1). FACS analysis using CD11b isolated a specific cell population in Acomys and Mus (Figure 2A–B). While we observed a significant increase in CD11b+ cells in response to injury in both species (two-way ANOVA with main effect time F = 31.86, p<0.0001 and species F = 17.06, p=0.0002), the acute increase at D3 was significantly greater in Mus than Acomys (Sidak's multiple comparison test p<0.05) (Figure 2C). Because CD11b isolates macrophages and neutrophils, we next sought to individually quantify neutrophil and macrophage influx at the injury site in Acomys and Mus. We first used the well-characterized cell surface Ly6G antigen to separate neutrophil and macrophage populations in Mus (Bain et al., 2014; Mirza et al., 2009; Rose et al., 2012) and detected a clear population of Ly6G+ cells (Figure 2—figure supplement 2A). This population of Ly6G+ cells was significantly elevated in healing tissue between D1-D7, with peak numbers occurring at D3 (Figure 2—figure supplement 2B). Whereas Ly6G+/CD11b+ cells dominated the injury site at D3 in Mus (Figure 2—figure supplement 1C -blue dots), these cells were replaced by a Ly6G-/CD11b+ population at D7 (Figure 2—figure supplement 2C - red dots). Thus, during the initial wave of leukocyte recruitment in Mus (D1-5), CD11b+ cells are primarily neutrophils and at later stages of inflammation (D7-D15) CD11b+ cells are primarily macrophages (Figure 2—figure supplement 2D). Interestingly, we did not detect a clear Ly6G+ population of CD11b+ cells from either tissue or circulating blood isolated from Acomys (Figure 2—figure supplement 2A). The failure to resolve a discrete population of Ly6G+ cells in Acomys suggested neutrophils might more closely resemble rat and human neutrophils which lack Ly6G (Lee et al., 2013). The mouse Ly6 gene complex is composed of 11 known Ly6 genes. Of these, the subcluster Ly6b, c, g and e are most highly expressed by mouse neutrophils, whereas rat and human lack all these genes except Ly6e (Lee et al., 2013). While we identified the genomic sequence and expressed transcript for the Acomys homolog of Ly6e (Table 1), examination of the Ly6 gene complex using our preliminary A. cahirinus genome revealed no homologs for Ly6b, Ly6c or Ly6g (Table 1). These data reveal that the genomic structure for the Ly6 complex in Acomys is similar to rat and human suggesting that Acomys neutrophils more closely resemble rat and human neutrophils which also lack Ly6g (Lee et al., 2013). Given these results, we turned to the neutrophilic marker MPO which reliably detects polymorphonuclear cells in tissue sections across species (Bradley et al., 1982; Petrie et al., 2014; Seifert et al., 2012b). We assessed MPO reactivity at D1, D3, D5 and D10 to compare neutrophil accumulation and clearance in Mus and Acomys (Figure 2D,E). Neutrophils were readily identified as MPO+ with multi-lobed nuclei (Figure 2D), and Mus displayed a significantly higher number of neutrophils 24 hr after injury when compared to Acomys (two-way ANOVA with main effects, species F = 8.229, p=0.007 and time F = 11.12, p<0.0001; Sidak’s multiple comparison test for simple effect between species, p<0.05 at D1) (Figure 2E). After D1, Mus and Acomys showed comparable numbers of neutrophils at the site of injury with a return to baseline levels by D10 (Figure 2E, Sidak’s multiple comparison test for simple effect between species, p>0.05 at D3-10). In both species, neutrophils initially accumulated distal to the cut in the dermis and periodically exhibited signs of cell death (e.g. pyknotic nuclei and reduction in cell size). We also observed neutrophils within the scab at all timepoints analyzed (Figure 2D). Taken together, our results show that both species exhibit neutrophil infiltration, accumulation and clearance in response to injury, although neutrophils accumulate faster, at higher levels and appear to be more active 24 hr after injury in Mus. Concomitant with neutrophil invasion, circulating and tissue-specific macrophages are activated in response to injury and are recruited to the injury site at the outset of regenerative and scarring responses (Godwin et al., 2013; Li et al., 2012; Nguyen-Chi et al., 2015; reviewed in Novak and Koh, 2013; Petrie et al., 2014; Varga et al., 2016). To ascertain total macrophage abundance in healing tissue, we employed the pan-macrophage marker, ionized calcium-binding adaptor molecule 1 (IBA-1), to quantify the spatiotemporal pattern of macrophage infiltration in Acomys and Mus. IBA-1 is an actin-binding protein active in macrophages and microglia and has been used to label cells in mouse, dog, cat, human and other primates (Imai et al., 1996; Köhler, 2007; Pierezan et al., 2014; Sasaki et al., 2001; Schmidt et al., 2016). In Acomys, we found IBA-1+ cells in the mesenchyme and the epidermis, but IBA-1 was specifically absent from polymorphonuclear neutrophils (Figure 2F, arrows). We found no significant difference in the amount of IBA-1+ cells between Mus and Acomys at D5, D10 or D15 (Figure 2G, two-way ANOVA main effect species F = 0.132 p=0.723, and main effect time F = 0.438 p=0.655). 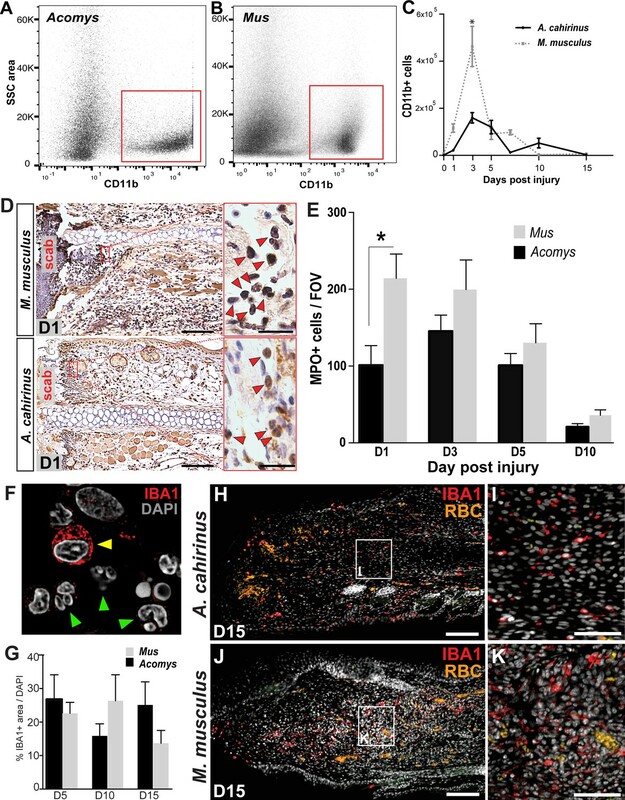 Accumulation of IBA1+ cells occurred at similar levels in both species within 200 μM proximal to and distal to the site of injury (Figure 2H–K). Notably, IBA-1+ cells were present within the blastemal region of D15 ears in Acomys (Figure 2H,I) as well as within the central granulation tissue region of D15 ears in Mus (Figure 2J,K). These data demonstrate that macrophages persist at the injury site during regeneration and scarring up to 2 weeks after injury. To determine the extent of the inflammatory reaction in vivo, we measured myeloperoxidase (MPO) activity and reactive oxygen species (ROS) production (Tseng and Kung, 2012). To track MPO activity in vivo we used luminol, a chemiluminescent compound that exhibits specific and high sensitivity for phagocyte-mediated MPO activity from neutrophils (Gross et al., 2009). Due to its larger size and reduced cell permeability (compared to luminol), we used lucigenin to measure ROS production by NADPH oxidase. Lucigenin chemiluminescence is primarily attributed to macrophage activation, and to a lesser extent from endothelial cell and neutrophil populations (Tseng and Kung, 2012). Tracking luminol chemiluminescence, Mus displayed peak MPO activity between 24–48 hr after injury (Figure 3A, repeated measures ANOVA F = 5.095, p<0.001). This finding was congruent with our immunohistochemical cell count data using MPO (Figure 2E). While Acomys displayed a similar peak in MPO activity, the magnitude was significantly muted compared to Mus (Figure 3A, *Sidak's multiple comparison test p<0.05 for time points indicated). Conversely, Acomys exhibited a much more robust production of ROS compared to Mus during the entire inflammatory phase (Figure 3B, repeated measures ANOVA F = 4.536, p<0.001). Lucigenin chemiluminescence peaked 24 hr after injury in Acomys and remained significantly elevated compared to Mus through D5 (Figure 3B, *Sidak's multiple comparison test p≤0.05 for the time indicated). Throughout the inflammatory phase, lucigenin chemiluminescence was significantly muted in Mus (Figure 3B). Together, these data suggest a bias toward strong neutrophilic MPO activity during scarring and early and prolonged macrophage-produced ROS during regeneration. Persistence of macrophages at the injury site, coupled with stark differences in ROS production suggested that macrophages might positively affect regeneration consistent with observations during Xenopus tail regeneration (Love et al., 2013). In vivo depletion of macrophages using clodronate liposomes during axolotl limb regeneration and via genetic ablation in zebrafish caudal fins supports a requirement for these cells to stimulate a regenerative response (Godwin et al., 2013; Petrie et al., 2014). Clodronate liposomes have been widely used to deplete systemic and local populations of phagocytes, the majority of which are macrophages (reviewed in van Rooijen and Hendrikx, 2010). In order to test if macrophages also regulate epimorphic regeneration in spiny mice, we depleted these cells by injecting clodronate liposomes (Clo-Lipo) at the base of the ear immediately prior to injury (D0), at D2, and at D5 (Figure 4A). Control animals received similar injections of PBS liposomes (control) (Figure 4A). Whereas control ear holes initiated a regenerative response and began closing at D5, Clo-Lipo injected animals did not initiate ear hole closure until D20 (Figure 4B–C). In contrast to control ears, which showed complete ear hole closure by D34, all Clo-Lipo injected ears remained open past D44 (Figure 4B,C). Complete hole closure and regeneration among Clo-Lipo-treated ears was delayed, with 3/12 closed by D53, 8/12 ears closed by D60 and 11/12 ears closed by D70 (Figure 4B–C). Although blastema formation and expansion occurred in PBS-Lipo-treated ears, examination of Clo-Lipo-treated ears showed a sharp reduction in cell accumulation past the original cut site anda delay in blastema formation at D20 (Figure 4D–E). The early stages of blastema formation were evident in 50% of macrophage-depleted ears (4/8) beginning at D20 (Figure 4D–E, dotted line denotes original plane of biopsy). In Clo-Lipo-treated ears, we noted a slight expansion of ear hole area and residual scabbing at D10 suggesting defects in re-epithelialization following macrophage depletion (Figure 4B–C). Indeed, examining macrophage-depleted ear pinna at D5 we observed a lack of cartilage histolysis (Figure 4F, green arrow) and a delay in re-epithelialization (Figure 4F, blue arrows). This delay in re-epithelialization was coincident with an accumulation of neutrophils (Figure 4G yellow arrowheads) when compared to control ears (Figure 4H–I). Monocytic cells were apparent throughout the tissue in control ears (Figure 4H green arrowheads) but were absent in Clo-Lipo treated ears (Figure 4F). We confirmed effective depletion of macrophages from the injury site by staining for the pan macrophage marker IBA-1 (Figure 4J–L). Macrophage populations can be restored within 2 weeks of the final Clo-Lipo injection (Ames et al., 2016; Li et al., 2013; Summan et al., 2006; Sunderkötter et al., 2004), and IBA-1+ cells at D20 reveals a return of macrophages in Clo-Lipo-treated ears, concurrent with re-epithelialization and initiation of blastema formation (Figure 4M–N). Together, these data support the important activity of macrophages to facilitate histolysis and re-epithelialization during the early phase of regeneration. Furthermore, our data suggests that macrophages directly or indirectly are necessary for blastema formation during regeneration in spiny mice. Macrophages maintain an interesting duality as professional phagocytes and as coordinators of the local immune response. Because macrophages were present and persistent during regeneration and scarring, it was possible that macrophage phenotype might contribute to the different healing outcomes. First, we asked whether spiny mice macrophages could undergo classical (M1) and alternative (M2) activation under stereotypical conditions (Figure 5). We isolated spiny mouse bone marrow as previously described for Mus (Edwards et al., 2006) and activated these cells using Macrophage-Colony Stimulating Factor (M-CSF) to produce activated bone-marrow-derived macrophages (BMDM) (Figure 5). After 1 week in culture, all BMDM were CD11b+ (Figure 5A). Next, we tested if Acomys macrophages could undergo classical and alternative activation (polarization) toward an M1 or M2 phenotype, respectively. Classic activation assays stimulate BMDMs with the pro-inflammatory molecules interferon gamma (IFNγ) and lipopolysaccharide (LPS) which specifically increase the expression of CD86 among other pro-inflammatory cell surface markers and cytokines (Edwards et al., 2006; Hathcock et al., 1994; Inaba et al., 1994). In response to IFNγ and LPS, Acomys BMDMs remained CD11b+ and upregulated CD86 compared to un-stimulated and M2 stimulated macrophages (Figure 5B–F). Alternative activation with interleukin 4 (IL4) increases the expression of CD206 (Stein et al., 1992) and Arginase 1 among other pro-reparative, cytoprotective genes. In response to IL-4, Acomys BMDMs remained CD11b+ and expressed CD206 (Figure 5C,I). In contrast, most unstimulated and classically activated BMDMs were CD206- (Figure 5G–H). In addition to CD206, stimulation with IL-4 also elicited Arginase 1 reactivity in BMDMs (Figure 5F). We also isolated and activated BMDMs from Mus and confirmed they display a similar pattern of protein regulation in response to polarization (Figure 5J–R). In addition to these phenotypic markers, we also tested the mouse pan macrophage marker F4/80 (Austyn and Gordon, 1981) for its reactivity to Acomys macrophages (Figure 5—figure supplement 1). Using unstimulated BMDMs, we only found a small subset of F4/80+ cells in Acomys compared to ubiquitous labeling in Mus (Figure 5—figure supplement 1A,D). Following IFNγ+LPS stimulation, we observed an increase in F4/80+ Acomys macrophages, whereas IL-4 stimulation did not increase F4/80 labeling compared to unstimulated BMDMs (Figure 5—figure supplement 1B–C). Examining F4/80 staining in vivo, we found that F4/80+ cells were distinct from CD206+ cells in Acomys (Figure 5—figure supplement 1G). In contrast, we found that F4/80+ cells were mostly CD206+ in Mus supporting its localization as a pan macrophage marker in Mus (Figure 5—figure supplement 1H). Thus, our in vitro and in vivo findings suggest that F4/80 only marks a subset of macrophages in Acomys (most likely M1). Despite this difference in F4/80 reactivity, our in vitro results show intrinsic similarities between Acomys and Mus macrophages supporting a general capacity to activate and change phenotype given specific wound contexts and stimuli. Next, we addressed whether differences in the spatiotemporal distribution of macrophage subtypes might promote regeneration in lieu of scarring. First, we quantified accumulation of classically activated macrophages in healing tissue by staining for CD86 (Figure 5E and Figure 6A–B). Using immunohistochemistry to localize CD86+ cells in Acomys and Mus, we determined these cells were rare in uninjured ear tissue (Figure 6—figure supplement 1A–F). Although rare, in Mus, we did find CD86+-positive cells in the epidermal layer reminiscent of human Langerhan’s cells (Boltjes and van Wijk, 2014) and in the perichondrium (Figure 6—figure supplement 1A–F), whereas in uninjured Acomys tissue CD86+ cells were restricted to the dermis (Figure 6—figure supplement 1D–E). These cells had long, thin projections and a spindle-like shape characteristic of dermal dendritic cells found in humans (Boltjes and van Wijk, 2014). We next assessed the distribution of CD86+ cells during regeneration and scarring. Comparing CD86+ cells distal to the injury between species, we found a significant effect of time (two-way ANOVA F = 131.8, p<0.0001) and species (two-way ANOVA F = 220.0, p<0.0001) whereby injury elicited a strong increase in CD86+ cells per unit area in Mus, but not in Acomys at D3 (Sidak's multiple comparison test p<0.05) (Figure 6A). Examining the spatial distribution of CD86+ cells in Mus, we found that they accumulated in the connective tissue distal to the cut cartilage (Figure 6B). Co-staining with the T-cell surface marker CD3 revealed interactions between CD86+ and CD3+ cells in this region as well as in the epidermis, consistent with the role of CD86 as a co-stimulatory molecule for T-cell activation (Figure 6B). 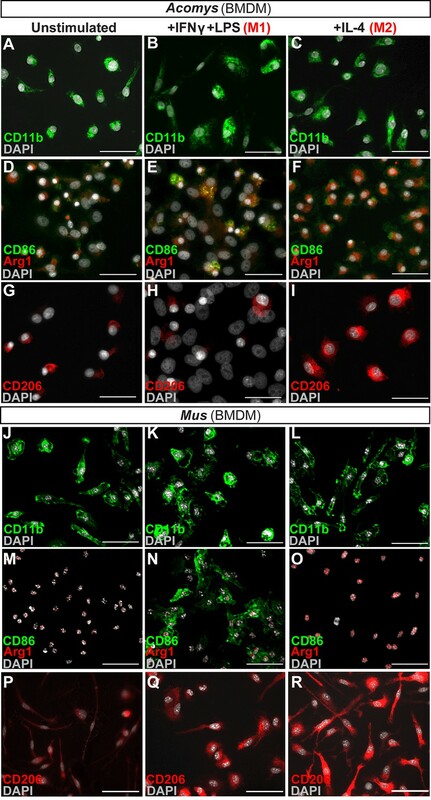 In contrast to Mus, CD86+ macrophages behaved very differently in Acomys during regeneration. Following injury, we did not observe CD86+ cells accumulating in the blastema (Figure 6B and Figure 6—figure supplement 1J). Instead, at D15 we observed clusters of CD86+ cells located almost exclusively lateral to the cut cartilage (Figure 6B). Thus, while CD86+ cells are present in Acomys, they remain proximally restricted and do not infiltrate the blastema, whereas these same cells in Mus accumulate in newly deposited connective tissue (granulation tissue). Although alternatively activated (M2) macrophages are usually associated with pro-regenerative outcomes, this concept remains largely untested for epimorphic regeneration (Campbell et al., 2013; Kigerl et al., 2009; Wang et al., 2014). Using our comparative system, we tested for an association between CD206+ (M2) macrophages and a regenerative response. Prior to injury, CD206+ cells were spatially distributed throughout the ear in similar numbers in both species (Figure 6—figure supplement 2A–D). These cells were present in the dermis between the epidermis and elastic cartilage of the ear (Figure 6—figure supplement 2A–D). We did not detect CD206+ cells in the epidermis in either species. Quantifying CD206+ cells distal to the injury in Mus and Acomys, we observed no significant difference across time (two-way ANOVA, F = 2.330, p=0.125) or between species (two-way ANOVA, F = 1.540, p=0.23) (Figure 6C). After D3, CD206+ cell numbers remained constant in Acomys and Mus and showed no significant change distal to the injury site (Figure 6C). Unlike CD86+ cells that localize proximal to the injury in Acomys, CD206+ cells were observed distal to the injury site in Acomys (and Mus) (Figure 6D and Figure 6—figure supplement 2E–H). However, the distal distribution of these cells in Acomys appeared regionalized with a CD206+ dense region directly beneath the epidermis and a CD206+ sparse region in the central blastema region of the injury (Figure 6D). In Mus, CD206+ cells were evenly distributed throughout the connective tissue distal to the injury (Figure 6D). Together with our data for IBA-1, our results show that while macrophages infiltrate the injury area during regeneration, the blastema is relatively free of classically activated macrophages. A popular hypothesis to explain why most mammals heal injuries with scar tissue is that they evolved a strong inflammatory and adaptive immune response that induces intense fibrosis in lieu of regeneration (Godwin, 2014; Mescher et al., 2017). Yet, the fact that some mammals exhibit epimorphic regeneration (e.g. rodent and primate digit tips, rabbit and spiny mice ear punches and skin) (Borgens, 1982; Gawriluk et al., 2016; Goss and Grimes, 1975; Han et al., 2008; Joseph and Dyson, 1966; Neufeld and Zhao, 1993; Seifert et al., 2012a; Singer et al., 1987) suggests that regeneration can occur despite a complex adaptive immune system. Different immune system components and inherent physiological differences between mammals and traditional regeneration models like salamanders, newts and zebrafish (e.g. homeothermy versus poikilothermy, high versus low metabolic rates, etc.) make it difficult to extrapolate how inflammation and immunity might act to affect regeneration in mammals. There have been few studies detailing how the immune system responds during epimorphic regeneration and thus how it compares to immune mediated fibrosis. In this study, we have begun to address how inflammatory cells behave during complex tissue regeneration in African spiny mice (Acomys). We identified key differences in the spatiotemporal infiltration of inflammatory cells in regenerating and scar-forming systems and demonstrated that reactive oxygen species (ROS) catalyzed through NADPH oxidation were significantly increased at the injury site during regeneration. Importantly, we showed that macrophages were required for regeneration to proceed. These results support a role for inflammatory cell signals polarizing the injury response toward two very different outcomes. Our characterization of circulating leukocyte profiles in Acomys and Mus, demonstrate that inherent differences in myeloid cell numbers do not explain intrinsic differences in regenerative ability. This contradicts a recent report suggesting that spiny mouse blood is neutropenic and that lower numbers of circulating neutrophils are responsible for a muted inflammatory response to injury (Brant et al., 2016). 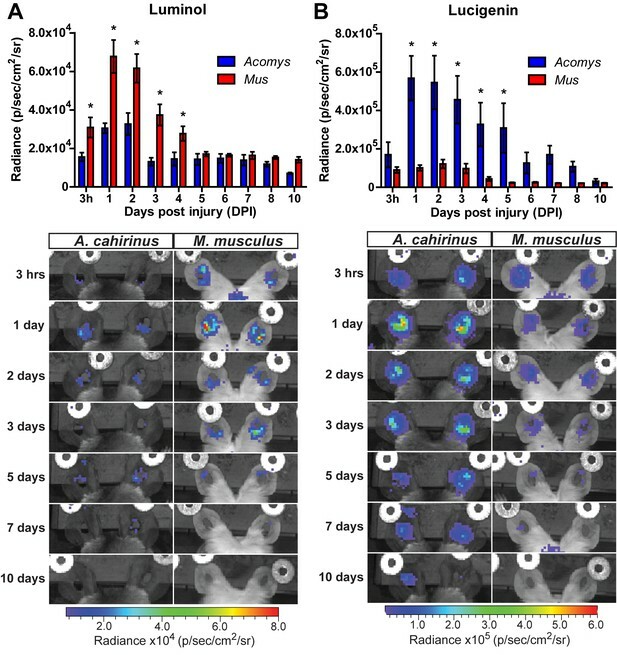 In fact, our immunohistochemical data comparing neutrophil infiltration in Acomys and Mus show that while neutrophils accumulate faster during scarring, peak neutrophil numbers are equivalent 3 days after injury in both species. In general agreement with this data, we observed differences in the intensity of myeloperoxidase activity via luminol chemilumenscence persisting until D4 after which time there was no difference across species. 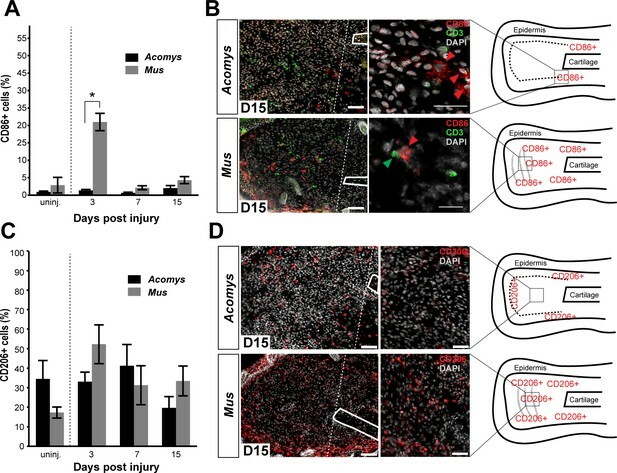 While neutrophil invasion in response to injury is apparent across all regenerating vertebrates (Jordan and Speidel, 1924; Li et al., 2012; Seifert et al., 2012b), our results suggest that precise activity levels could lead to different injury outcomes. While prolonged inflammation can antagonize regeneration (Margalit et al., 2005; Mescher et al., 2013), our data supports an initial wave of cell-based inflammation as a shared feature of any injury response, including regeneration. Along with neutrophils, monocytes also infiltrate local tissue after injury, and converging evidence suggests that macrophages are required in some capacity for epimorphic regeneration (Godwin et al., 2013; Petrie et al., 2014). Our results extend these vertebrate studies by demonstrating a similar requirement during epimorphic regeneration in mammals. Acute depletion of phagocytic monocytes with clodronate liposomes delayed the initiation of ear hole closure and blastema formation by up to 2 weeks. Importantly, re-commencement of blastema formation was concurrent with the return of macrophages into the injured tissue. Examination of ear tissue at D5 revealed that phagocyte depletion delayed re-epithelialization and histolysis, two key events that are themselves required for regeneration. It is possible that macrophages provide an initiating signal for regeneration or remove subpopulations of local cells secreting inhibitory signals (e.g. senescent cells). In support of the first idea, ROS production has been suggested as an essential early signal for regeneration based on studies in Xenopus and zebrafish tail models of regeneration (Gauron et al., 2013; Love et al., 2013). Macrophages are a major source of ROS after injury, and we observed significantly stronger and prolonged ROS production during regeneration compared to scarring (Weber et al., 2016). Understanding the functional consequences of balanced ROS production through NADPH oxidation versus myeloperoxidase activity will require a more complete understanding of what cell types are responsible for ROS production and how ROS more specifically can affect local cellular phenotypes. In support of the idea that macrophages may limit inhibitory signals through selective removal of senescent cells, recent work in salamanders suggested that clearance of senescent cells is important for limb regeneration (Yun et al., 2015) and persistence of senescent cells during liver regeneration leads to excessive fibrosis (Krizhanovsky et al., 2008). Furthermore, the accumulation of senescent cells with age has been suggested to shorten lifespan, degrade tissue function, and increase the expression of pro-inflammatory cytokines in mammals (Baker et al., 2016, 2011). These and other studies suggest that proper clearance of senescent cells from damaged tissues may promote regenerative outcomes. Interestingly, as the induction of cellular senescence occurs during normal wound healing when a scar forms, it is possible that clearance of senescent cells is less important than the secretory phenotype of these cells which in some contexts can promote regeneration. For instance, short exposure to factors secreted by senescent cells in response to injury decreases fibrosis and promotes stem cell gene expression (Chiche et al., 2017; Jun and Lau, 2010; Ritschka et al., 2017). These studies underscore the importance of analyzing how senescent cells regulate regeneration and scarring and provide evidence that the phenotype of senescent cells and their timely removal by macrophages could be an important factor in Acomys ear regeneration. While our data demonstrates that macrophages as a total population are required for regeneration in mammals, a requirement for macrophage subtypes and how these cells interact with other immune cells during epimorphic regeneration is not known. Because the activation of macrophages is generally associated with collagen production and fibrotic disease (Duffield et al., 2005; Gibbons et al., 2011; Wynn, 2008), the question remains as to how these immune cells orchestrate both regeneration and scar-formation in different species. Previous studies suggest a temporal component to macrophage function as a major factor for determining the outcome to skin, liver and bone injury (Alexander et al., 2011; Arnold et al., 2007; Duffield et al., 2005; Mirza et al., 2009). While we did not observe temporal differences in total macrophage accumulation between Acomys and Mus in the ear pinna, we did observe distinct differences in the spatial distribution of macrophage subtypes. For instance, while M2 (CD206+) macrophages were present at comparable levels in Acomys and Mus, we observed a zone dense in CD206+ macrophages in Acomys that were associated with de novo hair follicle development and a zone sparse in CD206+ cells that were associated with an area of decreased collagen production and blastema formation. Whereas CD206+ cells were absent from the blastema in Acomys, in Mus, we observed CD206+ cells throughout the collagen-rich granulation tissue, a situation similar to fibrosis observed during skin wound repair (Mirza and Koh, 2011; Song et al., 2000; Willenborg et al., 2012). The spatial restriction of CD206+ cells suggests unique interactions between macrophages and surrounding cells may drive differences in a pro-regenerative or pro-fibrotic environment. On the other hand, it is possible that the local environment (cells and/or ECM) in regenerating systems drives immune cell profile instead of immune cells driving injury outcomes. We noted an accumulation of M1 macrophages (CD86+ cells) in injured Mus tissue, and the ability of CD86+ cells to interact with CD3+ T-cells is consistent with the role of CD86 as a co-stimulatory molecule that promotes T-cell activation and production of pro-inflammatory cytokines (Hathcock et al., 1994; Lanier et al., 1995; Peng et al., 2013). Conversely, the Acomys blastema was mostly devoid of M1 macrophages and we did not observe CD86+/CD3+ interacting cells. This was not due to an inability to detect M1 macrophages in Acomys, as we readily observed these cells at the boundary between injured and uninjured tissue. Moreover, we found that Acomys macrophages up-regulated CD86 in vitro when classically activated in response to IFNγ and LPS stimulation (Ding et al., 1993; Freedman et al., 1991). 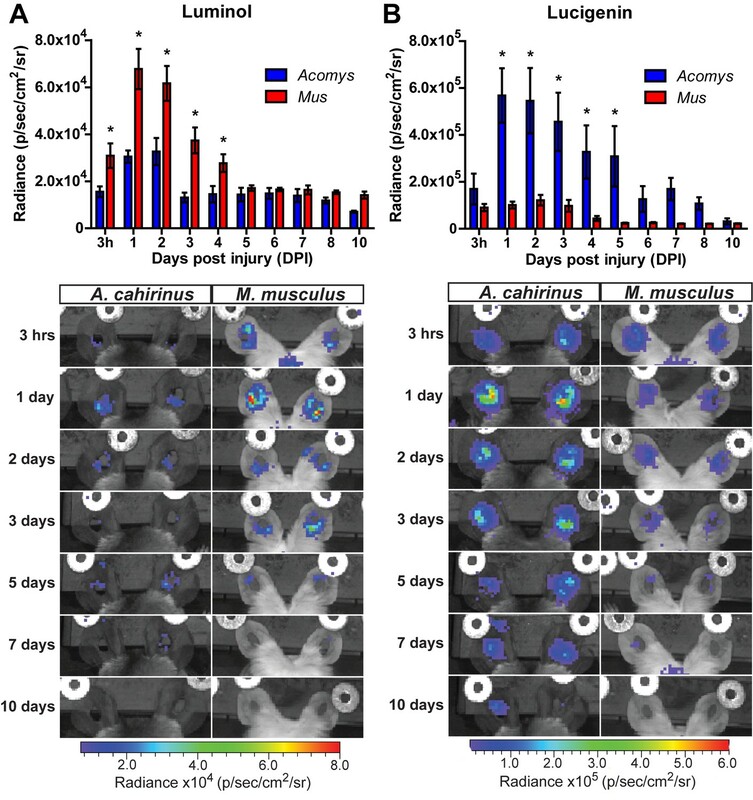 This shows that Acomys macrophages possess the intrinsic ability to express M1 markers (e.g. CD86) in response to pro-inflammatory stimuli, but may be inhibited from doing so within the blastema in vivo. A recent report suggested that spiny mice regenerate skin because they lack a robust inflammatory response (Brant et al., 2016). While our findings contradict their primary conclusions, careful re-interpretation of their data supports the idea that inflammation occurs during regeneration and scarring, and that different inflammatory cell phenotypes polarize the response to injury. Brant et al. based their conclusions on three primary findings. First, they presented circulating leukocyte profiles showing spiny mice with lower neutrophils and higher lymphocytes in circulation when compared to CD1 mice and suggested this would lead to fewer neutrophils in spiny mice wounds. As we have shown, neutrophils indeed arrive at the wound bed and numbers are not significantly different three days post injury. Interestingly, our data for myeloperoxidase activity suggests that differences in neutrophil activity, rather than simple numerical differences, likely play a more important role during the injury response. Second, they were unable to detect macrophages in spiny mice wounds using F4/80 and concluded no macrophages infiltrated regenerating skin wounds. Using a cross-species marker for total macrophages (IBA1), we show that macrophages indeed infiltrate an injury site. More importantly, we demonstrate that macrophages are required for regeneration. Instead, differential infiltration of macrophage subtypes exists between regeneration and scarring. While F4/80 may be a pan-macrophage marker in mice, studies have shown that this is not the case for humans (Hamann et al., 2007), and it remains unclear if this is the case for other mammals. Our data shows that F4/80 marks a subset of macrophages with pro-inflammatory characteristics in Acomys (i.e. F4/80+ cells are increased with M1 stimulation in vitro and F4/80+ cells do not colocalize with the M2 marker, CD206, in vivo). When re-interpreted with this knowledge, their results align with our findings that reduced numbers of pro-inflammatory macrophages enter the wound site during regeneration or are present, but not activated toward a pro-inflammatory phenotype. Thirdly, using a cytokine array designed against mouse antigens they detected 30 cytokines during acute inflammation (D0-D7 post injury) in Mus, but only detected 12 of these cytokines in spiny mice during the same period. They interpreted the absence of 18 cytokines as an absence of these signals in spiny mice wounds. However, without validation of epitopes, failure to detect particular spiny mouse cytokines on a Mus-specific cytokine array does not reflect an absence of spiny mouse antigen. Moreover, of the 12 spiny mouse cytokines they did detect, 5 are classic pro-inflammatory markers (e.g. IL-1α, IL-1ß, IL-1ra, CXCL13 and IFNγ) that were upregulated in response to injury and present at similar levels to Mus. Thus, their spiny mouse cytokine data demonstrates strong acute inflammation in response to injury. Although nuances between regenerating dorsal skin wounds and complex tissue of the ear pinna are likely to exist, fine-tuning inflammatory responses is key to promoting scar-free outcomes. Of the mammalian models of epimorphic regeneration that exist, very few have investigated how inflammatory cells affect blastema formation and regeneration. A forthcoming study on digit tip regeneration lends support to our conclusion that macrophages are required to help initiate regeneration (Muneoka et al., 2017). Autoimmune-prone MRL mouse strains and their parent strain LgJ have been promoted as a mammalian regeneration model (Clark et al., 1998). Paradoxically, while these strains possess enhanced rates of healing, published reports across most injury models have demonstrated that they do not regenerate (Colwell et al., 2006; Gawriluk et al., 2016; Moseley et al., 2011; Smiley et al., 2014). Studies have documented that the healing response of the MRL mouse differs depending upon the type of injury, be it the ear pinna or other tissues (Beare et al., 2006; Colwell et al., 2006; Davis et al., 2007; Kench et al., 1999; Rajnoch et al., 2003; Tolba et al., 2010). In the ear specifically, although 2 mm biopsy punches close and form new cartilage nodules (Clark et al., 1998), larger holes and a 2 mm crush injury heal with excessive collagen deposition producing a scar (Gawriluk et al., 2016; Rajnoch et al., 2003). In our view, the use of MRL strains as purported regeneration models has obscured their potential utility for studying inflammation and fibrosis. Of interest, MRL mice have been extensively studied for their aberrant macrophage profiles (Dang-Vu et al., 1987; Donnelly et al., 1990; Santoro et al., 1988). Bone marrow and peritoneal macrophages proliferate without CSF stimulation (Hamilton et al., 1998), a rare observation among other strains of mice, and accumulation of macrophages is commonly observed in MRL tissues (Bloom et al., 1993; Davis and Lennon, 2005; Yui et al., 1991). Macrophages in strains of MRL mice show higher production of H2O2 suggesting higher pro-inflammatory activity (Dang-Vu et al., 1987) and show increased expression of Tgfβ1, a growth factor implicated during increased fibrosis (reviewed in Border and Noble, 1994; Kench et al., 1999). Thus, MRL macrophages and their response to injury are unique in many respects. A detailed study of the immune response in MRL mice could instruct how inflammation guides fibrotic repair based on intrinsic and environmental tissue differences. Macrophage phenotypes change based on environmental cues (Stout et al., 2005) and macrophages that infiltrate injured tissue exhibit temporal changes in gene and protein expression (Arnold et al., 2007; Varga et al., 2016). In addition, cancer and mesenchymal stem cells (MSCs) can drive macrophage phenotypes dampening the production of pro-inflammatory cytokines (reviewed in Gao et al., 2016). These observations underscore the fluid nature of macrophage phenotypes in response to injury and disease and support a model where different subtypes differentially affect healing outcomes. Although further work is needed to clarify macrophage activation phenotypes during regeneration, our results support the initial inflammatory environment as a potential source of pro-regenerative signals. Future studies in spiny mice will need to determine how specific immune cell types signal to local cells, whether macrophages induce change in the ECM and if these cells can be manipulated in a non-regenerative system. Future studies into the role of specific macrophage and other immune cell phenotypes will resolve the role of these cells in scar formation and regeneration. Acomys cahirinus and Mus musculus (Swiss Webster Envigro_Harlan Hsd:ND4) were housed at the University of Kentucky, Lexington, KY. A. cahirinus were housed at a density of 10–15 individuals in metal wire cages (24 in. x 18 in. x 16 in., height x width x depth) (Quality Cage Company, Portland, OR) and fed a 3:1 mixture by volume of 14% protein mouse chow (Teklad Global 2014, Harlan Laboratories, Indianapolis, IN) and black-oil sunflower seeds (Pennington Seed Inc., Madison, GA) 1x/day (Haughton et al., 2016). Mus were fed mouse chow only. Acomys and Mus mice were exposed to natural light, and all animals used were sexually mature. Experiments used a combination of male and female animals matched between species. For ear punch, animals were anesthetized with 3% vaporized isoflurane (v/v) (Henry Schein Animal Health, Dublin, OH) at 1 psi oxygen flow rate. A 4 mm biopsy punch (Sklar Instruments, West Chester, PA) was used to create a through-and-through hole in the center of the right and left ear pinna. Ear tissue was collected at specified time points with an 8 mm biopsy punch (Sklar Instruments, West Chester, PA) circumscribing the original injury. All animal procedures were approved by the University of Kentucky Institutional Animal Care and Use Committee (IACUC) under protocol 2013–1119. Healing ear tissue was harvested as outline above at D0, 1, 3, 5, 7, 10 and 15. To create a single-cell suspension, both ears were combined into one tube for each animal, and we used enzymatic and mechanical digestion as previously described with modifications (Jensen et al., 2010). Briefly, tissue was digested with a 1:1 trypsin, dispase solution for 1 hr at 37°C allowing for subsequent mechanical separation of the epidermis. Separated epidermis and dermis were incubated with a solution of collagenase (1 mg/mL, VWR RLMB120-0100), hyaluronidase (0.5 mg/mL, VWR IC1512780), and elastase (0.015 U/μL, VWR IB1753-MC) in HBSS (VWR 45000–456) for 1 hr at 37°C. Following digestion, cell suspensions were washed with PBS and filtered through a 70 μm cell strainer. Single-cell suspensions were incubated with an FcγR block (CD16/32 block, 20 μg/mL, BD Pharmingen Cat# 553141) followed by incubation with directly conjugated primary antibodies at 4°C for 1 hr. Antibodies included APC-conjugated Ly6G (BD Pharmingen Cat# 580599, 3 μg/mL), PE-conjugated CD11b (BD Pharmingen, Cat# 557397, 3 μg/mL), diluted in FBS-staining buffer (BD Pharmingen, Cat# 554656). Fluorescent-activated cell sorting (FACS) was carried out by trained experts in the University of Kentucky Flow Cytometry Core using the iCyt Synergy sorter system (Sony Biotechnology Inc., San Jose, CA). Laser calibration and compensation was performed for each experiment using unstained, single fluorescent, and fluorescent minus one (FMO) control samples. Dot plots were created using FloJo (version 10) (n = 4 animals per timepoint). Blood was collected from the submandibular venous bed of age and gender matched Acomys (n = 8) and Mus (n = 4). Individuals were anesthetized with 4% (v/v) isoflurane and gently scruffed so that the skin covering the submandibular venous bed was taut. A 5 mm lancet (Medipont Inc., Mineola, NY) was inserted quickly into the venous bed and one drop of blood was collected per slide, with a total of 3 drops per animal. Slides were allowed to air dry and were prepared for a Sudan Black B modified Giemsa-Wright staining as described by (Sheehan and Storey, 1947) using formaldehyde vapor fixation for 10 min. Slides were incubated for 1 hr in a filtered Sudan Black B (3 mg/mL, Sigma Aldrich, St. Louis, MO) disodium hydrogen phosphate solution. Slides were incubated with Giemsa-Wright (Sigma Aldrich, St. Louis, MO) stain followed by a 1 min wash in 0.5% acetic acid. Slides were allowed to air dry and coverslipped with CytoSeal XYL. Images were collected on an Olympus BX51 upright microscope at 40x magnification. Ten fields of view were acquired per slide for an average 9224 total cells per animal and an average 42 total white blood cells per animal. White blood cells were hand counted based on granular staining and nuclear morphology. Cell subtype is reported as a percent of total WBC per animal (n = 4 Mus, n = 8 Acomys). On the days indicated, animals with 4 mm wounds were anesthetized using 2.5% (v/v) isoflurane and injected I.P. with lucigenin (5 mg/kg in PBS; M8010 Sigma-Aldrich, St. Louis, MO) or luminol (100 mg/kg in PBS; A4685 Sigma-Aldrich). After approximately 10 min of incubation, the animals were imaged with a chemiluminescent, in vivo imaging-system (IVIS 200 Spectrum; Perkin Elmer, Waltham, MA). We determined that the peak activity occurs within 20 min post injection, and thus, measured luminescence during the first 25 min post injection. We acquired 15 images with a 60 s exposure, f-stop equal to 1, binning factor equal to 8, and a 21.6 cm field of view. To analyze the radiance emitted from the wounds, a circular region of interest with a diameter of 6 mm was placed around each ear wound and the total flux in the regions was measured. The maximum value for each wound over the 15 images was used for subsequent analyses. Harvested tissue was placed into 10% (v/v) neutral buffered formalin (American Master Tech Scientific Inc., Lodi, CA) and incubated at 4°C overnight. Tissue was washed three times with PBS, three times with 70% (v/v) ethanol and stored at 4°C in 70% (v/v) ethanol. All tissue processings were completed using a rapid microwave histoprocessor (Micron Instruments, Inc. Carlsbad, CA). Tissues were embedded in paraffin (Leica Biosystems, Buffalo Grove, IL) and 5-µm sections were placed onto Superfrost Plus slides (Fisher Scientific). Immunohistochemical and H & E staining were performed on deparaffinized and rehydrated sections. Immunohistochemical staining for rabbit anti-human MPO (Dako, Cat #A0398) was carried out as previously described (Gawriluk et al., 2016) using heat-mediated antigen retrieval in a Tris-EDTA buffer at pH9.0. For, secondary detection of the primary antibody, we used biotin-conjugated goat anti-rabbit antibody followed by HRP-conjugated streptavidin for 3,3’-diaminobenzidine conversion according to Vector Elite ABC staining kit (Vector, Burlingame, CA). Nuclei were counterstained with Mayer’s hematoxylin for brightfield visualization and coverslips mounted with Cytoseal XYL (ThermoFischer, Waltham, MA). Immunofluorescent staining was performed on flash frozen tissue collected in Tissue-Tek OCT (Sakura, Torrance, CA) and frozen on dry ice. 8 μm sections were collected on a Leica CM1900 cryostat at 20°C. Tissue was subsequently fixed to slides with ice-cold acetone for 15 min and washed in PBS. Slides were incubated with primary antibodies overnight: rat anti-mouse CD86 (1:100, BD Biosciences, Cat #553698), goat anti-mouse CD206 (1:1000, R and D Systems, Cat #AF2535), rabbit anti-human CD3 (1:400, Dako, Cat #A0452), rabbit anti-mouse IBA1 (Wako, Cat #019–19741). Secondary detection of antibodies was carried out using donkey antibodies conjugated to Alexa Fluor 488, 594 (1:500, Invitrogen, Carlsbad, CA) Nuclei were counterstained with 10 µg/ml DAPI and coverslips were mounted using ProLong Gold mounting medium (Invitrogen, Carlsbad, CA) for fluorescence. To quantify the total area of positive signal for fluorescent images, three photomicrographs within the center of the injury were obtained at 40x magnification using an Olympus BX53 fluorescent deconvolution microscope (Olympus America Inc). Quantification of positive signal was performed on four separate samples (one ear per animal) per time point (unless otherwise noted) by thresholding fluorescent signal and mask subsampling with Metamorph Imaging software (Molecular Devices, Sunnyvale, CA). The ratio of total immuno-positive area per total area of the region of interest was then calculated. To quantify total number of DAB-positive cells, two photomicrographs within the center of the injury were obtained at 20x magnification using an Olympus BX53 microscope. Counts were calculated using the Cell Counter plugin for ImageJ (version 1.51d). Cells included in counts were based on both nuclear morphology and immuno-positive staining. Total positive cells were reported as a percent of total area (pixels) in a region of interest that excluded scab, epidermis, and cartilage plate. The ID of the samples being run was blinded from the user until the end of the analysis. Macrophage progenitors were isolated from femur and tibia of Acomys and Mus. After sacrifice, femur and tibia were surgically removed, and mechanically cleared of all skin, muscle and tendon. Marrow was aspirated from bones by flushing the marrow with 10 mL of RPMI +10% FBS through a 28 gauge syringe. Red blood cells were lysed with a hypotonic solution and remaining cells were plated at a density of 1 × 106 cells/mL in T-75 culture flasks. For the first 7 days, bone marrow cells were grown in complete RPMI media supplemented with 20% L929 media containing M-CSF, 10% FBS, 1% PenStrep. After 7 days in culture, BMDM were split using cold PBS and a cell scraper, plated onto coverslips in 24-well plates at a density of 5 × 105 cells/mL and allowed to settle for 24 hr in complete RPMI media supplemented with 10% FBS and 1% PenStrep. For macrophage activation, cells were stimulated with either 500 μL of IFNγ (20 pg/mL) and LPS (200 ng/mL) in cRPMI media 10% FBS or 500 uL of IL-4 (20 ng/mL) in cRPMI media 10% FBS. 24 hr after activation, media was removed, cells washed once with cold PBS and fixed with 10% neutral buffered formalin for 10 min at room temperature. After three washes with PBS to remove excess formalin, cells were permeabilized with 1% Triton x100 in PBS for 10 min. Immunocytochemistry was performed by first blocking non-specific binding sites using 5% goat serum in PBS block. Cells were washed once with PBS and incubated with primary antibody overnight at 4°C. Primary antibodies include rabbit anti mouse Arginase 1 (1:500 GeneTex, Cat #113131), goat anti mouse CD206 (1:1000, R and D Systems, Cat #AF2535), rat anti-mouse CD86 (1:100, BD Biosciences, Cat #553689), rat anti-mouse Cd11b (1:500, Abd Serotec, Cat #MCA74G), rabbit anti-mouse IBA1 (1:1000, Wako, Cat #019–19741), rat anti-mouse F4/80 (1:400, clone BM8, eBiosciences, Cat #14-4801-82). Detection of primary antibodies was accomplished by incubating cells with secondary antibody conjugated to Alexa Fluor fluorophores (1:1000, Invitrogen, Carlsbad, CA) as follows: Donkey anti-Goat AF546, Goat anti-Chicken AF488, Donkey anti-Rat 488, and Donkey anti-Rabbit 546. Cell nuclei were counterstained with DAPI and after air-drying, coverslips were mounted to slides using ImmunoMount (Invitrogen, Carlsbad, CA). Following previously reported protocols (Barrera et al., 2000; Li et al., 2013; van Rooijen and Hendrikx, 2010), we inject 20 μL of 50 μg/mL clodronate liposomes- or PBS liposomes (www.clodronate-liposomes.org, (van Rooijen and Hendrikx, 2010)) as vehicle control. Injections were performed using a Hamilton syringe (Hamilton Company, Reno Nevada) at the base of each ear at D0, 2 and 5 after injury. Tissue was collected at D5 (n = 3 Acomys/treatment) and D20 (n = 4 Acomys/treatment) for immunohistochemical and histological examination. Ear hole closure was measured over time using a digital micrometer (n = 6 Acomys, 12 ears per treatment). For analyzing immuno-positive cells, observations within the same mouse were averaged so analysis could be on the level of the experimental unit. For each marker, we analyzed the percentage of immune-positive signal as a fraction of total DAPI positive area using a two-way ANOVA with species, day and the species*day interaction). When noted, Sidak's or Tukey's multiple comparison tests were conducted where appropriate using Prism 6 Data analysis software (Graphpad Software Inc, La Jolla, CA). Sample size was determined by calculating power from previous immunohistochemical studies. These calculations show with appropriate transformation of percentages and a standard deviation of 0.07, groups of n = 4 animals should be sufficient to detect a species effect with a size of 0.16395 with 80% power and alpha = 0.05. To calculate sample size for repeated measures, we used previous wounding studies to determine maximum standard deviation of 2.21. These tests show groups of n = 5 animals, 10 ears should be sufficient to detect a treatment effect of 2.77 with 80% power and alpha = 0.05. To analyze the chemiluminescent data, we performed a repeated-measure, two-way ANOVA with time and species as main effects and Sidak's post-hoc tests to compare the species x time effect. Graphs were created using Prism and annotated in Illustrator (Adobe Creative Suite 6, San Jose, CA). Graphs display standard error of mean (S.E.M.) with statistical significance values indicated in figure legends. Sample size (n) is stated in each figure legend and refers to biological replication size (n = number of distinct animals) with the exception of in vitro studies in which n = number of technical replicates for BMDM activation. Journal of Bone and Mineral Research 26:1517–1532. The Journal of Experimental Medicine 204:1057–1069. Journal of Clinical Investigation 124:1382–1392. European Journal of Immunology 11:805–815. The New England Journal of Medicine 331:1286–1292. Journal of Investigative Dermatology 78:206–209. Wound Repair and Regeneration 24:75–88. Journal of Investigative Dermatology 133:2461–2470. Clinical Immunology and Immunopathology 88:35–45. Wound Repair and Regeneration 14:81–90. Wound Repair and Regeneration 15:577–588. Blood Cells, Molecules, and Diseases 34:17–25. Journal of Leukocyte Biology 73:448–455. Journal of Clinical Investigation 115:56–65. Journal of Leukocyte Biology 80:1298–1307. Cell Death and Disease 7:e2062. American Journal of Respiratory and Critical Care Medicine 184:569–581. European Journal of Immunology 37:2797–2802. Journal of Experimental Medicine 180:631–640. Journal of the American Association for Laboratory Animal Science : JAALAS 55:9–17. Biochemical and Biophysical Research Communications 224:855–862. Journal of Experimental Medicine 180:1849–1860. Journal of Experimental Medicine 40:1–11. British Journal of Surgery 53:372–380. Expert Reviews in Molecular Medicine 13:e23. Cell and Tissue Research 330:291–302. The Journal of Immunology 154:97–105. Journal of Leukocyte Biology 94:585–594. Journal of Biological Chemistry 287:25353–25360. Journal of Dermatological Science 56:168–180. The Journal of Pathology 229:176–185. Trends in Cell Biology 15:599–607. Developmental & Comparative Immunology 66:98–110. The American Journal of Pathology 175:2454–2462. The Journal of Experimental Medicine 205:43–51. Journal of Pharmacy and Pharmacology 63:648–656. Progress in Clinical and Biological Research 383A:243–252. The American Journal of Pathology 183:1352–1363. The Journal of Pathology 232:344–355. Journal of Comparative Pathology 151:347–351. Philosophical Transactions of the Royal Society B: Biological Sciences 359:777–784. 95–141, Macrophage involvement in wound repair, remodeling, and fibrosis, The Molecular and Cellular Biology of Wound Repair, Springer. Journal of Experimental Medicine 168:783–788. Biochemical and Biophysical Research Communications 286:292–297. The Journal of Pathology and Bacteriology 59:336. Journal of Leukocyte Biology 57:782–787. The Journal of Immunology 175:342–349. AJP: Regulatory, Integrative and Comparative Physiology 290:R1488–R1495. The Journal of Immunology 172:4410–4417. European Journal of Immunology 21:627–633. Wound Repair and Regeneration 18:662–670. The Journal of Immunology 196:4771–4782. American Journal of Physiology - Lung Cellular and Molecular Physiology 309:L1487–L1498. Journal of Experimental Zoology 261:62–78. The American Journal of Pathology 184:1167–1184. Journal of Experimental Zoology 212:243–253. The Journal of Pathology 214:199–210. The American Journal of Pathology 139:255–261. Thank you for submitting your article "Macrophages are necessary for epimorphic regeneration in African spiny mice" for consideration by eLife. Your article has been favorably evaluated by Fiona Watt (Senior Editor) and three reviewers, one of whom, Alejandro Sánchez Alvarado (Reviewer #1), is a member of our Board of Reviewing Editors. The following individuals involved in review of your submission have agreed to reveal their identity: Luisa DiPietro (Reviewer #2); David Stocum (Reviewer #3). This is an interesting paper opening new areas of mammalian regeneration research using the spiny mouse Acomys. Mammals repair tissue by scarring rather than regeneration and it is currently believed that is likely due to a robust adaptive immune system that favors fibrosis over regeneration. This is supported by indirect evidence from non-mammalian vertebrates such as urodeles, which regenerate successfully and possess relatively undeveloped adaptive immune systems when compared to mammals. In this paper, the authors used ear punch assays in both Acomys and M. musculus to compare and contrast the macrophage responses in these animals during wound healing and regeneration. 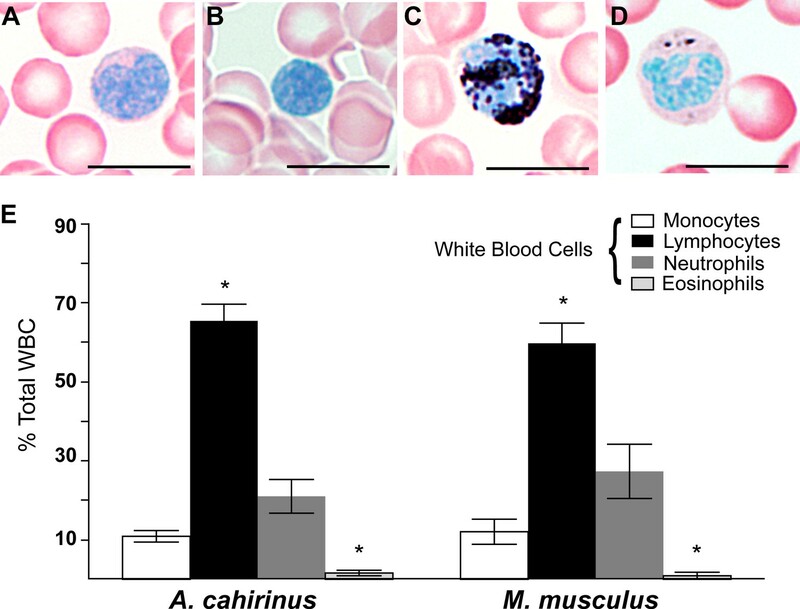 By directly comparing inflammatory cell activation in a 4 mm ear injury during regeneration (Acomys cahirinus) and scarring (Mus musculus), the authors uncovered that the profiles of circulating leucocytes are similar in each. Both species mount an acute inflammatory response that differed in that Mus had higher myeloperoxidase activity and Acomys had higher ROS activity, which could be related to scarring vs. regeneration. Curiously, the authors also noted that the spatial distribution of activated macrophage subtypes was unique during regeneration with pro-inflammatory macrophages failing to infiltrate the regeneration blastema. The analysis of leucocyte populations is meticulous and the data are consistent with the authors' conclusions. This paper chops away some of the undergrowth surrounding the idea that a highly developed adaptive immune system determines that scarring predominates over regeneration. Clearly, there is no large-scale difference between Mus and Acomys immune cells that determines the difference. To the contrary, an immune response is characteristic of both fibrosis and regeneration. Other, factors, therefore, appear to be in play in determining whether the outcome to wounding in mammals results in regeneration or fibrosis. 1) Data presentation would improve if the authors were to provide a time-course schematic of the ear punch regeneration assay such that it could be used to follow the data presented. Although this sequence has been published, a summary diagram would be of great help in allowing the reader to interpret the data. This would let the reader easily understand the context of the time points examined in the current manuscript without having to dig up the prior paper. 2) The authors should spend considerably more time comparing, contrasting and explaining the differences that exist between the work reported in this manuscript ant the work of Brant et al. Additionally, a more scholarly discussion of the implications of the reported results and those of published findings for the MRL mouse should be attempted. 3) The data on macrophage polarization seems incomplete – what is the reason that the arginase assessment was not performed on Mus? 4) Neutrophils and macrophages have many functions in wound repair. They have bactericidal effects; macrophages are phagocytic; they release growth factors such as PDGF, TGF-β and HGF that promote epithelialization and fibroblast proliferation. Can the authors correlate the spatial findings here on macrophage location with growth factor production (or lack thereof), as assessed in previous papers? 5) The work of Maximinia Yun should be mentioned here. She has shown that macrophages in regenerating urodele limbs remove senescent cells and that this is obligatory for regeneration. The accumulation of senescent cells has also been implicated in the aging of organs; clearance of these cells preserves function (Baker et al., 2016). Removal of senescent cells could be a factor in Acomys ear tissue regeneration. As per the reviewers' suggestion, we now include a time-course schematic as Figure 2—figure supplement 1. This new figure provides a graph (A) showing the mean kinetics of ear hole closure as a function of days post injury during regeneration in Acomys and scarring in Mus. The second panel (B) presents the process of regeneration following a 4 mm ear punch. It shows whole mount photographs of the ear pinna in both species during healing and aligns key processes (e.g., inflammation, re-epithelialization, blastema formation, etc.) as a function of days post injury. We believe this figure will assist the reader in following our experimental timelines and tie specific days to the overall injury response. 2) The authors should spend considerably more time comparing, contrasting and explaining the differences that exist between the work reported in this manuscript ant the work of Brant et al. We appreciate being encouraged to expand our Discussion to include this comparison in our manuscript. We agree that it is important to explain the differences reported in our study compared to the Brant et al., (2016) study that examined scar-free healing of dorsal skin wounds in spiny mice. Brant et al., (2016) concluded based on their data that spiny mice lack a robust inflammatory response and that this could partly explain their ability to regenerate skin. This conclusion was based on their data showing comparatively low numbers of neutrophils in circulation, an inability to detect macrophages in the wound bed following injury and a failure to detect many inflammatory cytokines during wound healing. Briefly, these authors did not present neutrophil data in skin wounds and relied solely on their circulating leukocyte profiles to infer that neutrophil numbers would be reduced at the injury site. While we cannot explain the discrepancy in leukocyte counts, in our study we increased biological replicates for Acomys (n=8) and used a modified Wright-Giemsa stain to clearly differentiate neutrophils based on Sudan Black incorporation into granules. The increased resolution of Sudan Black increases confidence in our own counts. Their failure to detect macrophages is based on the assumption that F4/80 is a pan-macrophage marker in spiny mice. This assumption is incorrect, a conclusion we arrived at during our own study. We believe this information is important enough to include and we have now supplemented our manuscript with additional data in Figure 5—figure supplement 1. Our new data presents in vitro reactivity and in vivo co-localization data for F4/80 comparing Acomys and Mus. As is clear from our data, F4/80 is not a pan-macrophage marker in spiny mice, and its use as such by Brant et al., led to their conclusion that macrophages did not infiltrate skin wounds. In fact, it appears that F4/80 marks a subset of M1 macrophages in spiny mice. In this light, their data supports our finding that M1 macrophages as marked with CD86 or F4/80 do not infiltrate the blastema. Lastly, their spiny mouse cytokine data is based on a failure to detect over half of the cytokines included on the arrays they used. Instead of validating the arrays for spiny mice protein binding, they interpreted a lack of signal as an absence of the molecule. Again, a careful re-interpretation of some of their data actually lends support to our own conclusions. As per reviewers' request, we have distilled our comparisons and explanations of the differences between the two reports in a paragraph within the Discussion. Additionally, a more scholarly discussion of the implications of the reported results and those of published findings for the MRL mouse should be attempted. We appreciate the reviewers’ request for a more scholarly discussion of the MRL mouse and the published results purporting regeneration in this inbred strain. As the reviewers are no doubt aware, past and present work with this strain as it relates to regeneration has been fraught with controversy. In most instances, rigorous investigation of different injury paradigms have shown that, rather than regenerate, these mice exhibit increased inflammation and fibrosis in response to healing (e.g., skin – Colwell et al., 2006, Wound Repair and Regeneration;heart – Moseley et al., 2011, Journal of Pharmacy and Pharmacology, Smiley et al., 2014, Cardiovascular Pathology, etc.). However, there are reports supporting regeneration. Recently, our group demonstrated that MRL mice fail to close 4mm ear holes and instead produce fibrotic tissue to fill 2mm ear holes (Gawriluk et al., 2016. Nature Communications) a feat observed in other inbred strains (Reines et al., 2009, Rejuvenation Research, Kench et al., 1999, Clinical Immunology) and detailed for 2mm punch injuries in MRL mice (Rajnoch et al., 2003, Wound Repair and Regeneration). However, we believe that the MRL strain can be useful for understanding how inflammation directs fibrosis. Compared to normal mice, MRL mice exhibit: hematopoietic cells that overexpress TGFß1 at injury sites, increased macrophage recruitment to tissues during homeostasis and injury, and macrophages that produce higher levels of H2O2, etc. These and other inflammatory cell anomalies in this strain may drive the increased fibrosis reported following injury. Thus, in response to the reviewer’s request, we have amended our Discussion and added a paragraph that addresses published data for the MRL mouse related to our findings. We have also included discussion of how this model might be useful for understanding how inflammation can regulate fibrosis. We had performed this analysis previously, but excluded the data for space considerations. In light of the reviewer’s request we have now included data for in vitro localization of Arginase 1 and CD11b in Mus for comparison to the parallel studies run in Acomys. This data is now included in revised Figure 5M-O. We appreciate this comment and believe that quantifying growth factor production during regeneration would be very informative, especially as it relates to macrophage subtypes, re-epithelialization, cell proliferation and healing outcomes. There are several technical limitations we are trying to surmount in order to conduct this type of analysis in spiny mice and so at present we cannot provide the requested information for inclusion in this manuscript. The size of the ear pinna, and specifically the very small distance between the central (distal) part of the injury relative to the cut cartilage, make it extremely difficult to physically separate different areas within the tissue from early time points for downstream proteomic analysis. For instance, because we see CD86+ (M1) macrophages at the wound margin, but not in the blastema, we would have to ensure that proximal tissue was not included during tissue collection to correlate macrophage subtype and growth factor localization. Immunohistochemistry is the most viable option, and we are currently validating markers to downstream targets of these growth factor signaling pathways. Laser capture techniques might be possible in combination with proteomics, but this approach is beyond the scope of the current study. We thank the reviewers for drawing a very exciting connection between the role of cellular senescence and tissue regeneration. In response to this request we have amended our Discussion to include a possible role for senescent cells during regeneration based partly on Dr. Yun’s work in salamanders and newts, and on data from other regeneration models. Senescent cells could also have a positive role depending on their phenotype and we include this in our amended discussion as well. Indeed, injury-induced induction of cellular senescence has been observed during limb regeneration in salamanders and newts (Yun et al., 2015, eLife) and preliminary work from our lab suggests a similar induction during regeneration in spiny mice and scarring in lab mice. Interestingly, injury induced cellular senescence and subsequent clearance by macrophages or natural killer cells occurs during normal wound repair when a scar forms (e.g., Kang et al., 2011, Nature,Krizhanovsky et al., 2008, Cell, etc. ).In these cases clearance of senescent cells appears to limit fibrosis, but it does not induce regeneration. Unfortunately, Dr. Yun’s study was not able to directly test whether the persistence of senescent cells (or an increase in their number) could inhibit regeneration due to a lack of tools in the salamander model (e.g., depleting macrophages inhibits blastema formation). Thus, her work leaves open the possibility that the type of senescent cells present upon injury might have positive or negative effects. All told, this is an active area of research for many labs and we agree with the reviewers that removal of senescent cells could be an important factor in Acomys ear regeneration. Furthermore, that macrophages can remove senescent cells points to an intriguing role for macrophages during regeneration. The authors would like to thank Jennifer Strange and Greg Bauman of the University of Kentucky Flow Cytometry and Cell Sorting Core Facility, which is supported in part by the Office of the Vice President for Research, the Markey Cancer Center and an NCI Center Core Support Grant (P30 CA177558) to the University of Kentucky Markey Cancer Center. We thank Jeremiah Smith, Shishir Biswas, and Chanung Wang for help with A. cahirinus transcriptomic and genomic data, and members of the Seifert and Gensel labs for insightful discussion. This work was supported by a grant from the National Science Foundation (NSF) and the Office for International Science and Engineering (OISE) (IOS −1353713) to AWS. JS is supported by a University of Kentucky Postdoctoral Research Fellowship. Animal experimentation: All animal procedures were performed with approval by the University of Kentucky Institutional Animal Care and Use Committee (IACUC) under protocol 2013-1119. Study design was in accordance with the Guide for the Care and Use of Laboratory Animals of the National Institutes of Health. © 2017, Simkin et al.